It’s important to look for ways to stay cool in the end-of-summer heat, and at Monticello, the first place that we look is to the past. While Thomas Jefferson’s era did not have the modern amenities we cherish in these warm months, he is credited with the first known ice cream recipe recorded by an American and likely was responsible for the popularization of ice cream within the country—talk about a delicious solution! Jefferson’s interest in this sweet treat carried over to his relative, Mary Randolph, who is best known for the publication of the influential cookbook The Virginian Housewife, published in 1824. 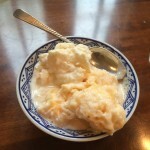 With 22 recipes on the topic, Randolph’s Virginian Housewife dotes on ice cream a surprising amount considering the period. Her cookbook includes recipes for almond ice cream, coffee ice cream, and quince cream, among others. 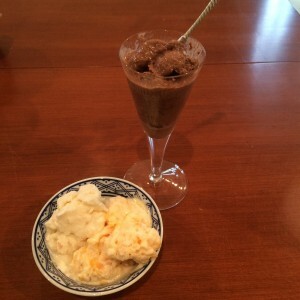 Feeling rather warm myself, I decided to try making some of these ice cream recipes myself. 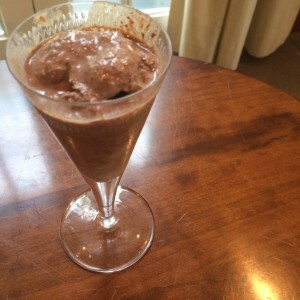 Although I was at first worried about how well I could handle making recipes from a 19th-century cookbook, I found that they were incredibly easy to make and totally satisfied my sweet tooth! 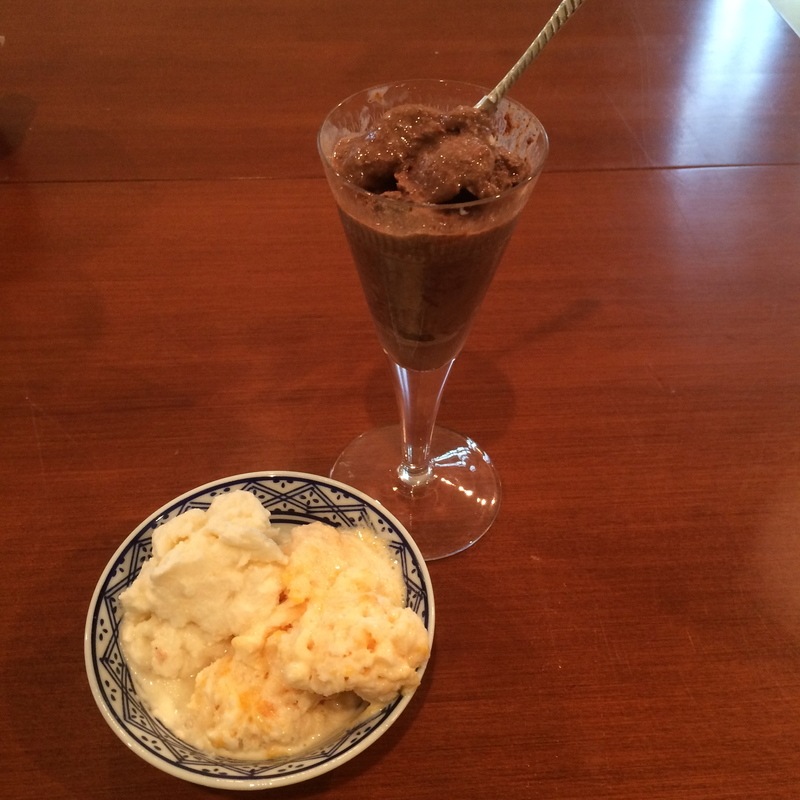 Chocolate ice cream in Monticello Stemware – Cordial, a Monticello exclusive! You will need: 3/4 cup of semi-sweet chocolate chips; 1 pint of full milk, half-and-half, or heavy cream (depending on how creamy you want it); 3 eggs; one vanilla bean. 1) Put the pint of milk in a saucepan. 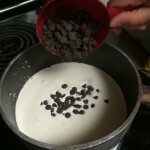 As you heat it over low, pour in the chocolate chips and the vanilla bean. Be sure to stir this continually. 2) When chocolate has dissolved, thicken the mixture with three eggs. 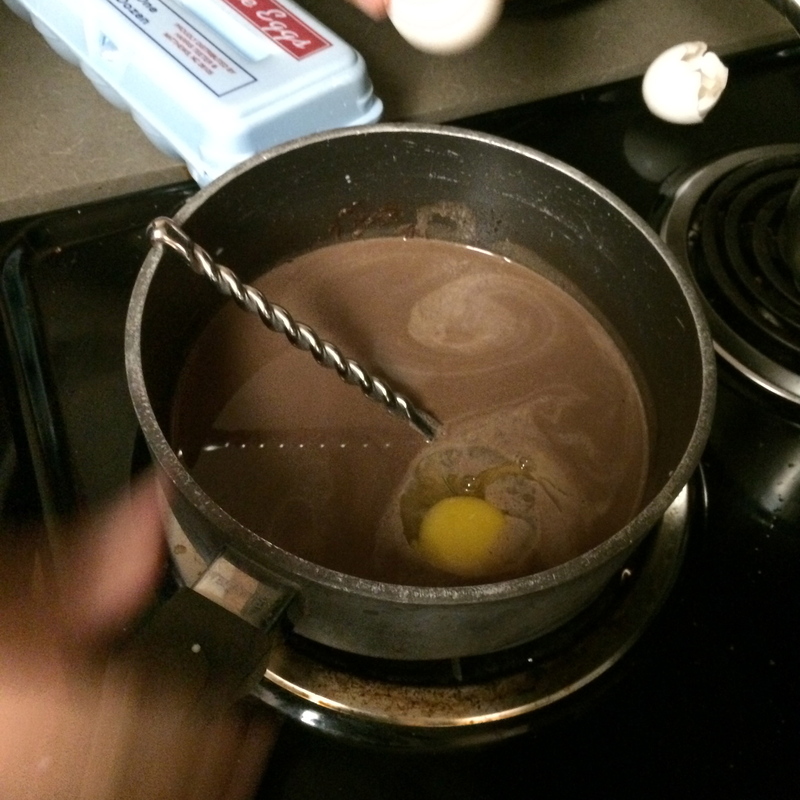 3) Keep on heat until mixture has fully blended, then freeze. 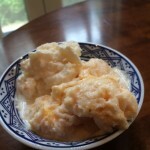 Peach ice cream on right; served in Monticello Reproduction Patty Pan. You will need: 3 peaches, ripe; 1 cup sugar; 1 pint of full milk, half-and-half, or heavy cream (depending on how creamy you want it). 1) Peel peaches, quarter them, remove stones, and place them in a bowl. 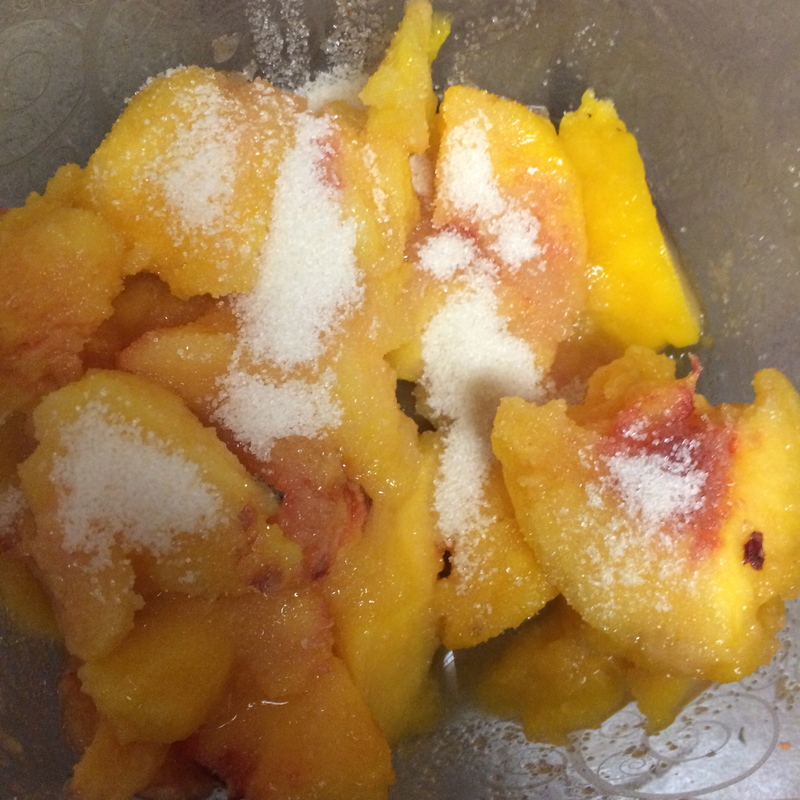 2) Sprinkle 1/2 cup sugar over the peaches. With a spoon, chop them very small until they become a smooth pulp. 3) Add pint of milk to the mixture and remaining 1/2 cup sugar. Stir. Lemon ice cream on left side; served with Twisted Handle Teaspoon! You will need: 4 lemons, 1 cup powdered sugar, 1 pint of full milk, half-and-half, and heavy cream (depending on how creamy you want it). 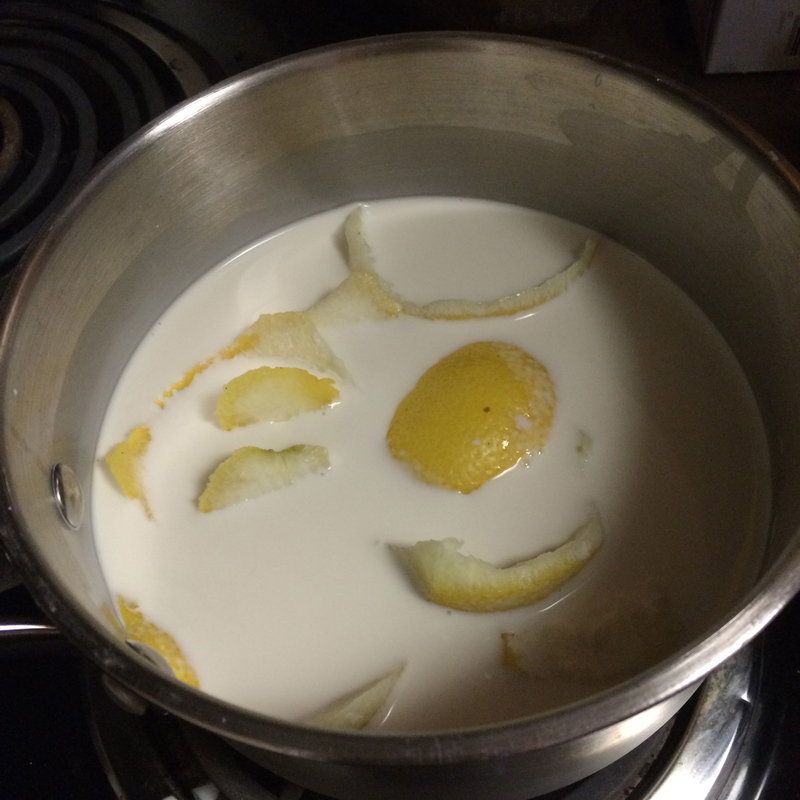 1) Pare the yellow rind from four lemons and put them with the pint of milk in a saucepan. Boil the mixture, making sure to mix continually, and remove from heat, placing in the refrigerator until completely cooled. 2) Meanwhile, strain the juice of one lemon and saturate the juice completely with the powdered sugar. 3) When the cream is cold, stir in the juice mixture, making sure that it does not curdle. If the mixture is not sufficiently sweet, add more sugar. 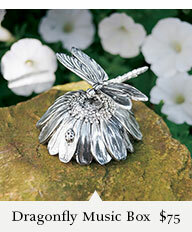 The Shop at Monticello is offering a NEW holiday contest this year! 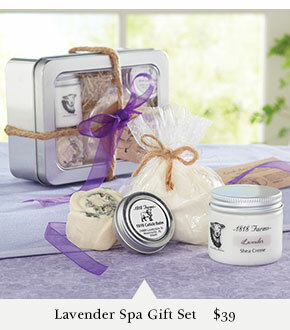 Anyone can head on over to Pinterest and Pin to Win a Monticello Musical Snow Globe. 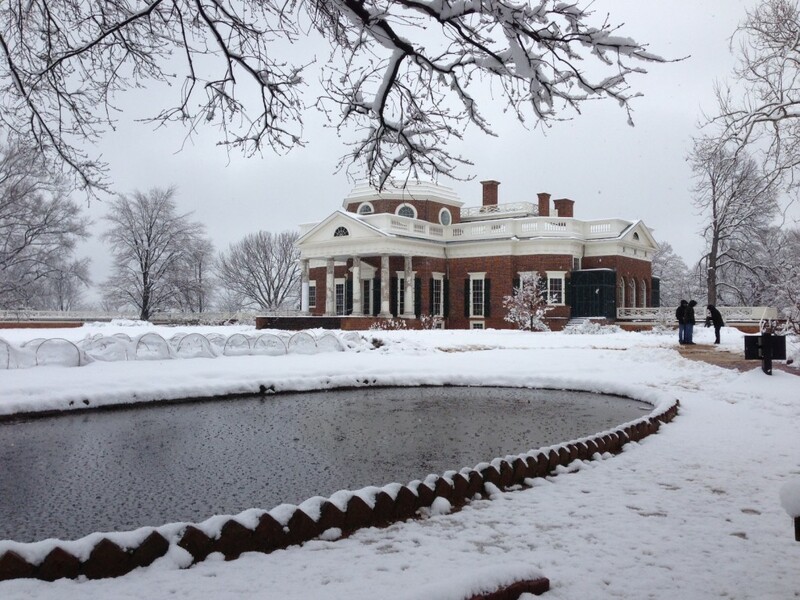 Monticello is truly beautiful after a new snow. Our highly collectible snow globe is an accurate three dimensional view of the home of Thomas Jefferson. The semicircular globe sits on a faux wood resin base. The snow globe plays Mozart’s Eline Kleine Nachtmusik, a song well known to Jefferson. 4 1/2″ diameter, 5 1/4″ high. 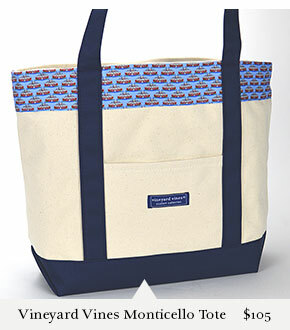 Available for $56. Attending a Monticello Holiday Event? Pin a photo from your visit with the hashtag #MonticelloHoliday and you could win the Monticello Musical Snow Globe and a Monticello Toasting Flutes Gift Set! Anyone who participates in a Wreath or Gingerbread House Workshop, the Holiday Open House, our Holiday Classic 5K, Handmade for the Holidays or a Holiday Evening Tour is eligible to enter. Jefferson was a true connoisseur. Monticello champagne flutes, with their clean forms and exquisite engraving, speak volumes about his taste for fine design. Very little of the glassware Jefferson purchased between 1767 and 1821 survives. Our stemware, based on a rare original, is mouth-blown full lead crystal, cut and etched by hand with a sprig and wheel band. 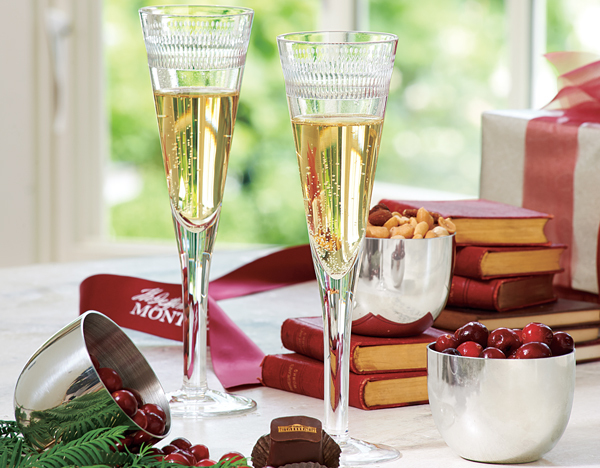 Each exclusive Toasting Flutes Gift Set includes two handmade champagne flutes nestled in a black velvet-lined gift box tied with Monticello ribbon. Toast the new year with style and celebrate weddings, anniversaries or other momentous occasions with our sophisticated stemware. 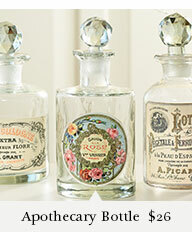 Each 5-oz. glass is 9″h and the set is a $149 value. 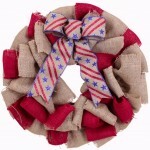 NEW Red, White, and Blue! 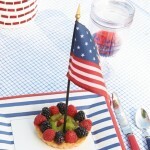 Decorate and dine with festive American flare this Memorial Day or Fourth of July! 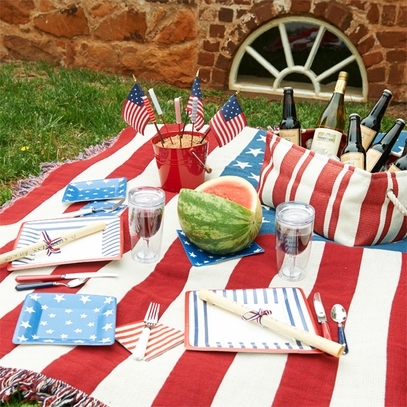 These new selections are perfect for your patriotic summer picnic or party. 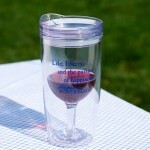 Looking for a ready-to-go celebration? 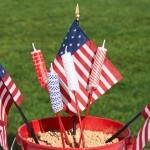 The Shop at Monticello’s Fourth of July Picnic Set includes packs of 8 paper dinner plates, 8 paper dessert plates and 20 cocktail napkins, two sets of red, white and blue silverware, two travel wine glasses, a tin bucket, two reproduction Declarations of Independence, three little 15-star flags and four fun firecracker mini-torch candles, all packed in a stylish red-and-white striped canvas tote. 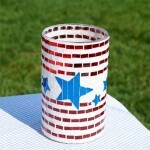 Draw on classic American designs and historical traditions for your patriotic gathering or Independence Day party. 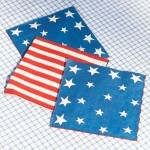 Red, white and blue cotton bunting made in the U.S.A. is the perfect design centerpiece for your celebration. 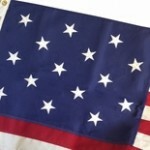 Salute the season with historical and modern American flag accents. 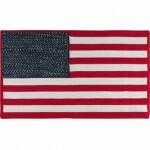 Flag-themed rugs are a wonderful way to greet guests and flag-themed throws invite your guests, family and friends to wrap themselves in American comfort. 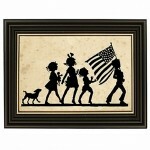 Accentuate your walls with a patriotic pop. Framed reproductions of American flags, historical prints and classic silhouettes, similar to those in Jefferson’s Monticello Parlor, showcase American pride and history. 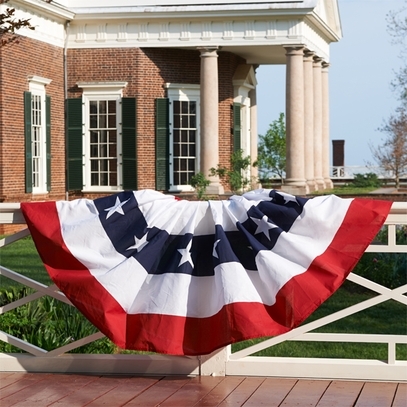 For a truly inspirational experience, celebrate the Fourth of July morning at Monticello, the home of the author of the Declaration of Independence. Since 1963, more than 3,000 people from every corner of the globe have taken the oath of citizenship at the annual Monticello Independence Day Celebration and Naturalization Ceremony. 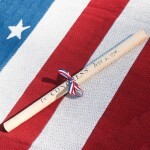 David M. Rubenstein will be the featured speaker on July 4, 2014 at Monticello’s 52nd Annual Independence Day Celebration and Naturalization Ceremony—the oldest continuous naturalization ceremony held outside of a courtroom in the United States. Rubenstein is best known as co-Founder and co-CEO of The Carlyle Group, a global alternative asset manager. It goes without saying that Jefferson needed a great deal of furniture to accommodate his many guests. 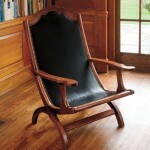 Jefferson commissioned numerous Windsor chairs for Monticello which could be moved around the house according to where guests were gathered. He prided himself on having stylistically cohesive designs for Monticello’s furniture; the Windsor chair’s classic style and high-quality woodwork complemented rather than disrupted his vision—even if an abundance of chairs were drawn into one room for entertaining purposes. 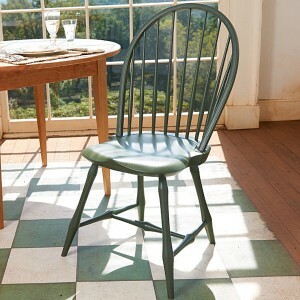 Today, the Windsor chair is featured throughout Monticello as a reminder of Jefferson’s love for entertaining guests. The Shop’s own Painted Bow-Back Windsor Chairs are so true to Jefferson style that Monticello curators have selected them to furnish newly restored rooms on the second and third floors of Monticello as part of the Mountaintop Project. In accordance with Monticello’s mission of preservation and education, the Mountaintop Project entails the restoration of the upper bedchambers and passages of Monticello, enabling guests to explore Jefferson’s mountaintop home as he knew it and learn more about the members of Jefferson’s household. 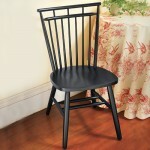 Add a touch of Jefferson’s stylish, functional simplicity to your own home with The Shop at Monticello’s Windsor Chair! This solid wood chair has bamboo-turned legs and a comfortable shaped seat. It’s made in the U.S.A. with the same care for quality as the originals, and like Jefferson’s Windsor chairs it looks great in any room in the house. 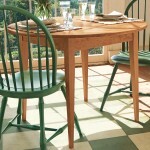 The Shop’s Round Cherry Table resembles tables made at the Monticello joinery and pairs nicely with the Windsor Chair. 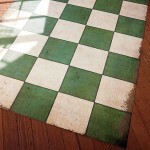 Complete the look with the Checkered Floorcloth, which is inspired by the floorcloths Jefferson placed in Monticello’s Entry Hall. These Jeffersonian pieces are sure to transform your home into a beautiful space for entertaining and make it the new favorite gathering place of your family and friends alike. 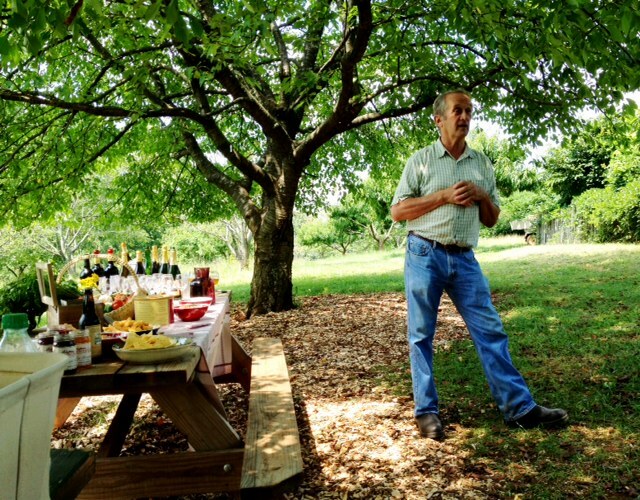 Between 1769 and 1814 Jefferson planted over 1,000 fruit trees in his South Orchard. Among Jefferson’s most successful fruits were the eighteen varieties of apples he planted. Apple trees adapted well to the region’s warm, humid summers and produced delicious fruits used for cider making and special desserts. The “Taliaferro” apple was known as one of Jefferson’s favorites; he described it as “the best cyder apple existing…nearer to the silky Champagne than any other.” Unfortunately, the Taliaferro has disappeared from cultivation and remains Monticello’s mystery apple. Today apples are planted in the South Orchard of Monticello and remain a favorite fruit in the Appalachian region, especially during the autumn apple-picking season! 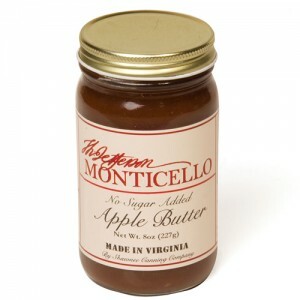 For an authentic taste of Monticello’s apple orchards, try the Shop’s Monticello Apple Butter at breakfast, lunch, or dinner! Wonderful on biscuits, toast, or waffles; cornbread, ham, or pork, this delicious spread packs the flavor of fresh Virginia apples and spices with no added preservatives or sugars. Our apple butter is made in Frederick County, Virginia at a family-owned farm and cannery started in 1828. 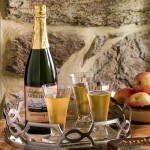 Celebrate Jefferson’s love for brewing and serving cider with our Monticello Sparkling Cider. A blend of several varieties of apples results in the clean, fruity taste of our non-alcoholic cider. This is the perfect drink for any fall party, or for simply toasting to the beautiful autumn season! 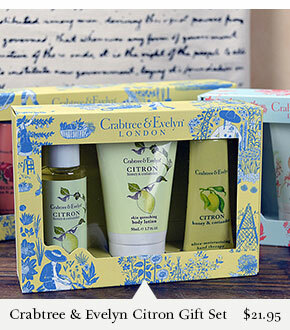 Inspired to grow apples in your own little orchard? 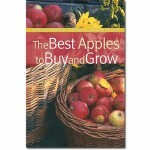 Consult The Best Apples to Buy and Grow, the home-grower’s guide to raising apples in the backyard. 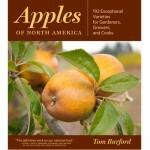 The guide not only features the “ABCs” of growing apples, it also serves as an encyclopedia of 60 of America’s best varieties of apples—making it the all-inclusive guide to apple growing, picking, purchasing, and cooking. 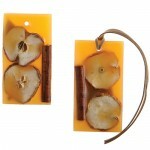 For added touches of apple to the home, check out the Shop’s Spicy Apple Botanical Wax Satchets, the Red Apple Wall Hanging, and the Red Delicious Apple Wreath. 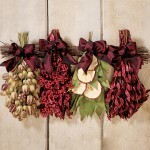 Guests will marvel at your creative incorporation of Monticello’s beloved fruit into your autumn home décor! House Beautiful magazine, the leading authority on American home design and decoration, recently announced the launch of a “pop up” guest editor series and named renowned interior designer, Charlotte Moss, as guest editor for the November 2013 issue themed “The Arts of Living.” A trustee of Monticello, Moss saw the November issue as a natural opportunity to highlight Jefferson’s legacy at his mountaintop home. She reached out to Pulitzer Prize-winning author, Executive Editor at Random House, and fellow Monticello trustee, Jon Meacham to collaborate. 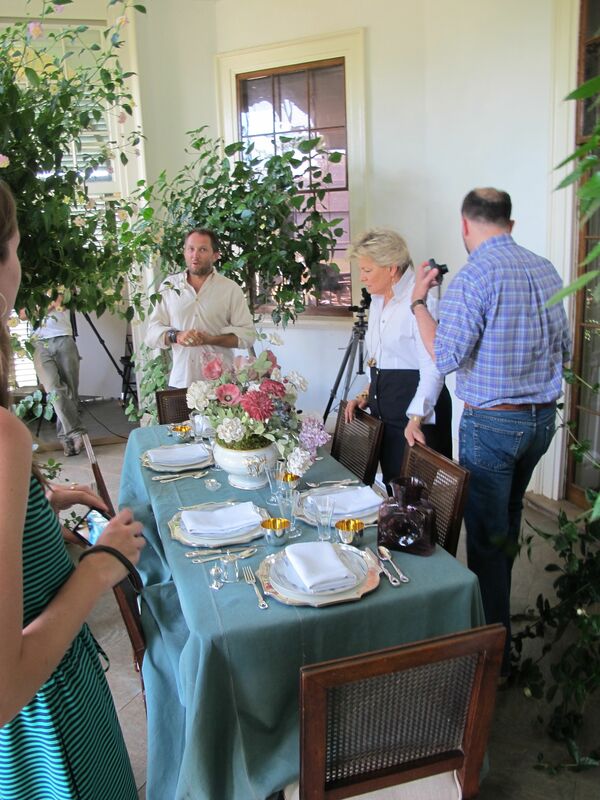 To gather images and inspiration for the November Issue, Charlotte Moss and House Beautiful arrived at Monticello for a two day photo shoot with a full crew of photographers, editors, and assistants this July. 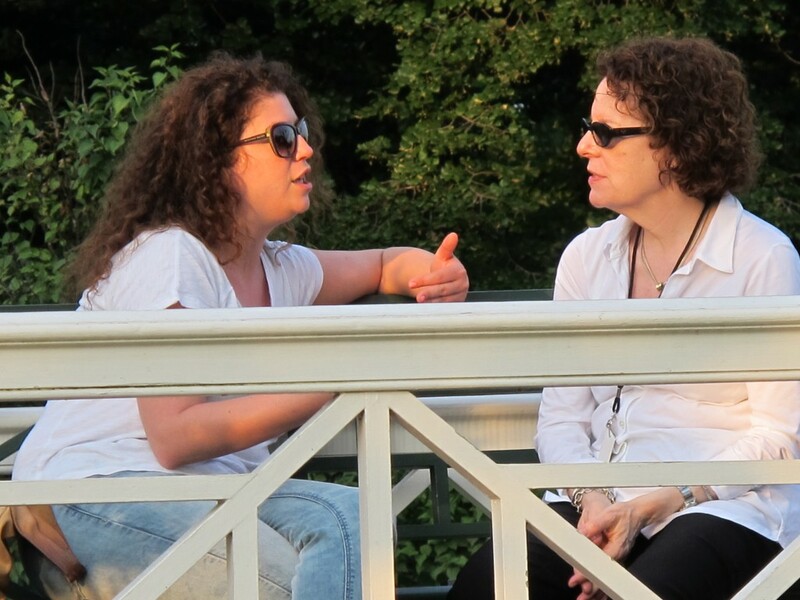 Then, Monticello staff, including Senior Curator and Vice President of Museum Programs, Susan Stein (below, center, to the right of HB‘s Orli Ben-Dor) and Director of Garden and Grounds, Gabriele Rausse, guided the House Beautiful crew around Monticello, answering questions and providing information for the magazine and web features. 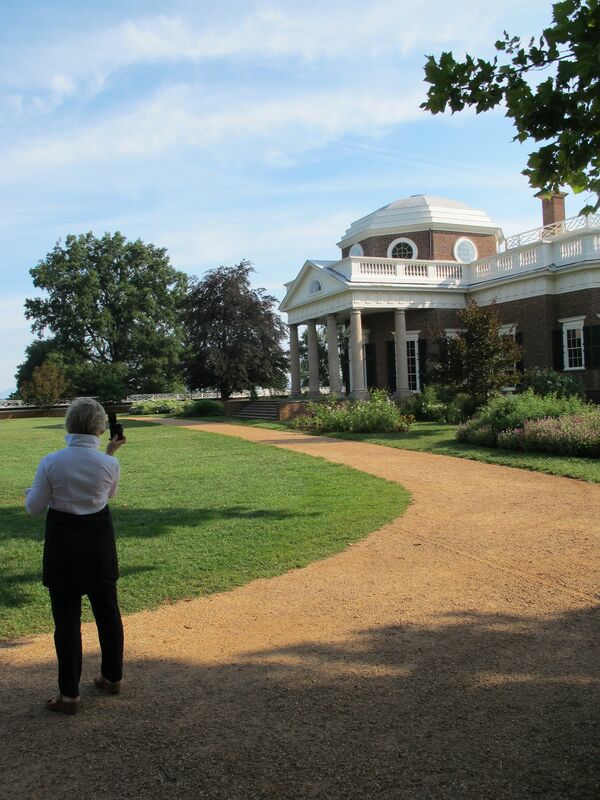 The tour included a full walkthrough of the house and gardens (below, left) as well as a trip to the Thomas Jefferson Center for Historic Plants at Tufton Farm. 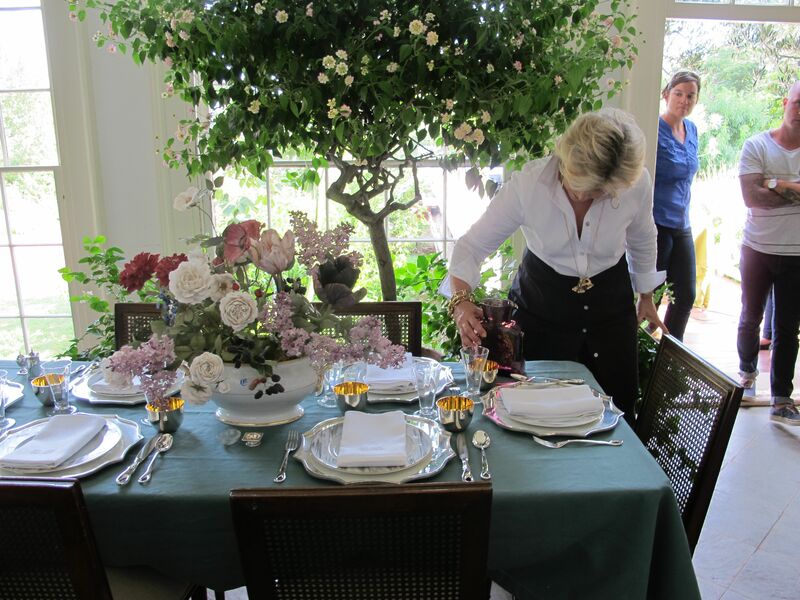 After the tour, lunch was set up in the Orchard (above). The House Beautiful crew tasted products from The Shop including Monticello Root Beer, Monticello Fig Preserves, and Monticello Peach Salsa. Fresh picked tomatoes and basil from the Vegetable Garden were also served while Gabriele Rausse (left) gave a talk on Jefferson, wine, and gardening. Next, Monticello staff and House Beautiful’s crew prepped for the photo shoot in The Greenhouse. Moss arranged the centerpiece in the staging area. Then everyone helped move the featured pieces into the Southeast Piazza . Moss added the finishing touches to the table (below) and the photographer captured the scene. The following morning, House Beautiful and Moss (left) returned to capture a few last shots of Monticello. 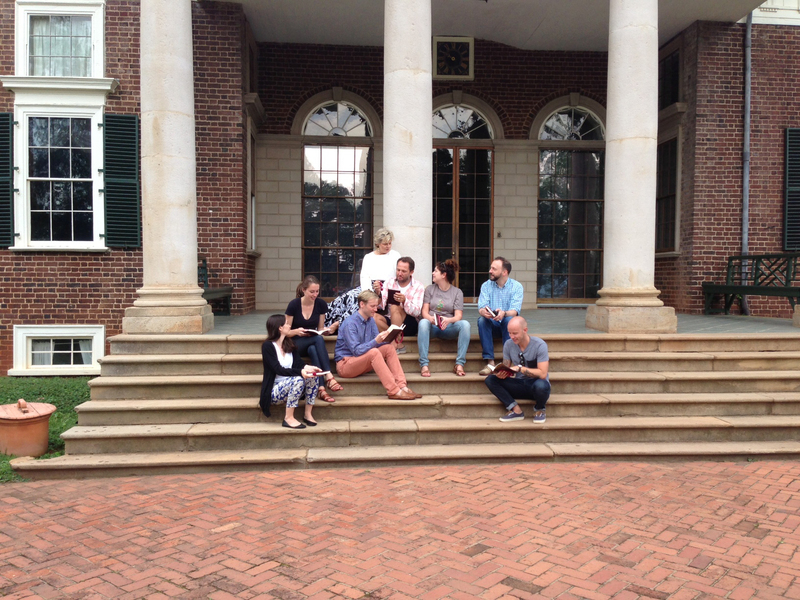 Once the final photograph was taken, the crew got a chance to relax, enjoy the scenery, and swap favorite quotes from The Words of Thomas Jefferson on the steps of Monticello (above). 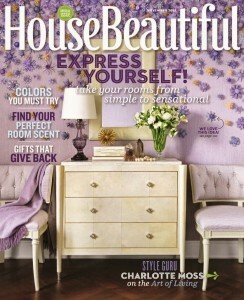 We loved hosting House Beautiful and we couldn’t be more excited about their magazine and web features of Monticello! 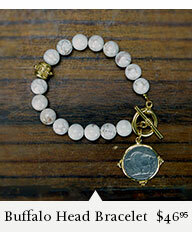 Visit The Shop for products featured by House Beautiful and inspired by Jefferson’s timeless genius and style. The drink was a daily staple; it was served at breakfast every morning and likely in the afternoon after dinner, in a silver coffee urn made to Jefferson’s design. After the English taxation upon tea in the 18th century, coffee became a nationwide symbol of American pride and self-sufficiency—virtues Jefferson certainly celebrated in every way at his Monticello home. Jefferson’s observations about the popularity of coffee remain as true today as they did in the 1820s. 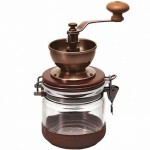 Our Monticello Coffee Collection celebrates the legacy of coffee at Jefferson’s historic home. The Shop’s Monticello Coffee Canister features his famous quotation and is a handy, attractive way to store your favorite coffee beans in the kitchen. A Monticello fretwork-patterned pewter scoop complements the quality stoneware and makes scooping beans for a morning brew simple and easy. Glazed in a similar style as the coffee canister, the Monticello Sugar Bowl is a kitchen staple. A pewter plaque displays etchings reminiscent of Monticello’s terrace walkway railings— a small but eye-catching expression of classic Monticello style. The sugar bowl is an elegant and handy accent piece; keep it available on the countertop for whenever you need a pinch of sweet in your coffee or tea. The Monticello Creamer features the same pewter plaque as the sugar bowl and is a beautiful addition to the medley of stoneware collection pieces. The creamer is a perfect addition to any breakfast spread as a milk pitcher for cereal or a cream carafe for coffee and tea. 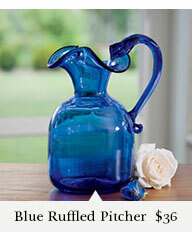 The quality stoneware ensures the creamer’s sturdy durability as a multipurpose vessel. Sample Jefferson’s preferred coffee flavors with a pot brewed from our Monticello Colonial Blend Whole Coffee Beans. Inspired by 18th and 19th century flavors from the East Indies, the coffee blend’s authentic, aromatic experience resembles that which Jefferson likely enjoyed in his Tea Room. Hand grind beans the to your exact specifications with a Canister Coffee Mill and enjoy a cup of the colonial blend in the Jefferson Coffee Quote Mug featuring our third president’s famed coffee quote. Thomas Jefferson often used gardening as a way to establish and foster good relationships. 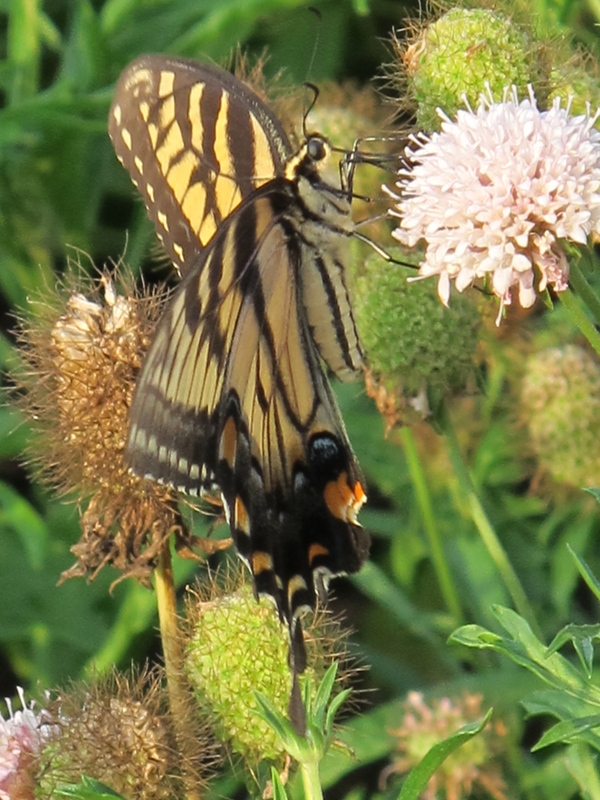 He sent plants and growing tips to his correspondents and annually participated in “Spring Pea” growing competitions with his neighbors around Monticello. No matter who won these competitions, the results were always celebrated with a fresh feast for the participants. 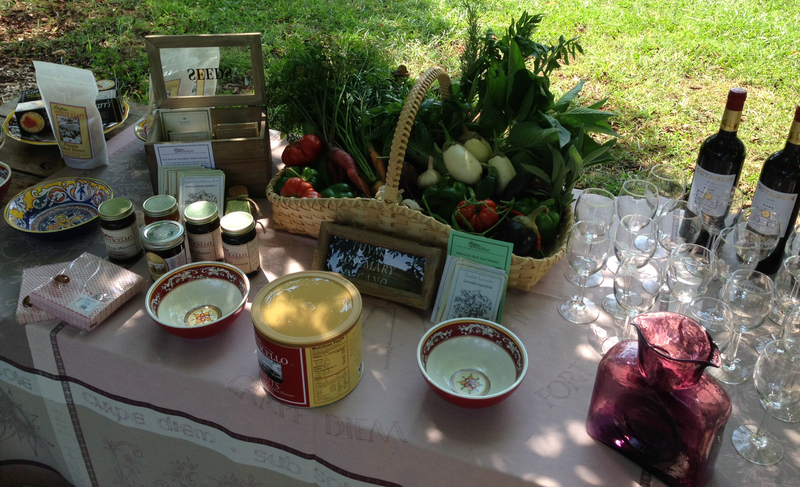 Celebrate Jefferson’s legacy on gardening by hosting your own Monticello-inspired Harvest Party. Pair your favorite fruits or vegetables with these fun and festive items from The Shop at Monticello. 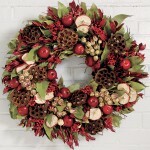 Set the tone before your guests enter your home with a seasonal wreath on your front door. Our Large Magnolia Bud Wreath and our Harvest Glow Wreath are two beautiful season-spanning decorative options. Seasonal scents like cloves and cinnamon, cocoa and vanilla, apples, berries, cumin and bergamot found in Monticello’s Autumn Spice Potpourri make your home both festive and inviting. 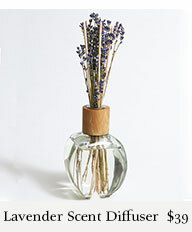 Add to the ambiance by mixing rustic textures with elegant touches and rich and bright colors throughout your décor. Our coordinated Monticello Garden Vegetable Plates, Placemats, and Napkins celebrate the Monticello Vegetable Garden and are a perfect match for a harvest theme. Carrots, beets, hot peppers and Jefferson’s favorite English peas form the colorful borders of the porcelain dinner plate and hemstitched cotton place mats. 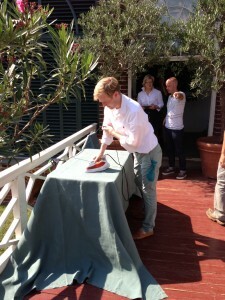 Specific vegetables are showcased on each salad plate and cotton/linen napkin. Exclusive to Monticello, these plates and linens are based on a tapestry design by famed textile artist Laura Foster Nicholson. “Like a giant, patterned textile just unfurled from the loom,” she wrote about the garden’s 1,000-foot, ribbon-like design. The plates are dishwasher-safe and the linens are machine-washable for easy clean up. Accent your table with functional style with our Monticello Personalized Pepper Mill. This impressive wooden pepper mill, almost as big as a 250 ml bottle, honors family, fine food and fine wine and can be personalized with a name and date. Need a good take away for your guests? Seed packets make perfect party favors. 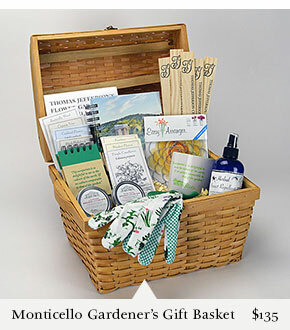 “Tie packets together with ribbon or feature them in a cedar box,” offers Leah Sumrall, Event Manager at Monticello. Another option Sumrall suggests is to “write your guests’ names on individual seed packets and use them as place cards.” Our Monticello Historic Seeds Sampler, Seed Packet Box with Heirloom Seeds, and Terra Cotta Pots with Monticello Seeds are all great options for favors that can double or triple their use as party decorations and fun post party activities. Carry the harvest theme from the décor through dinner and dessert. If you are throwing an end of summer bash, check out our Tomato Season blog for great dining options. For either season make sure to include a fresh fruit pie or cobbler for desert! 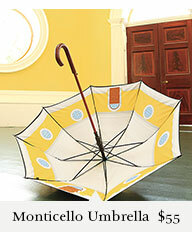 Southern Living Magazine’s August 2013 issue features Monticello as one of three iconic and historic Southern homes. Monticello is an expression of Thomas Jefferson’s interests in architecture, art, history, and innovation. 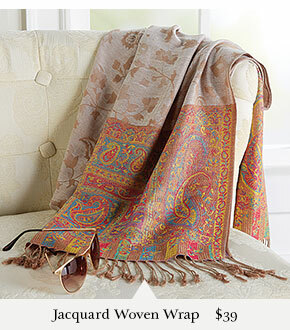 We celebrate Jefferson’s remarkable style for its timelessness and classic style. 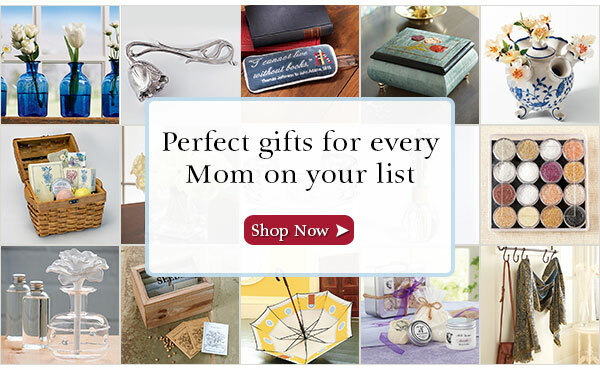 The Shop at Monticello allows you to bring the look home. Jefferson was a man of practicality; he filled his library with tools that were functional yet stylish. His family recalled that he spent hours at his desk penning letters to acquaintances, merchants, and political figures. Evoke the craft of quill calligraphy characteristic of Jefferson’s letters and Memorandum notes with our Pewter Inkwell and Quill Set. 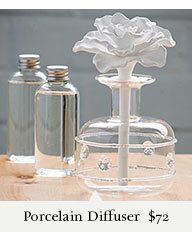 The beautiful inkstand is a statement piece in any office or library. Among the many ingenious devices found in Jefferson’s Cabinet the Revolving Bookstand was one that perhaps most clearly suggests Jefferson’s passion for knowledge. It was probably made or modified to Jefferson’s design and specifications in the joinery. Our Revolving Bookstand reproduction is a Jefferson classic and a true Monticello replica. Designed for efficient and easy access to five books at a time, one can imagine Jefferson swiveling his volumes about on his desk while engrossed in profound thought. Our bookstand keeps important reference books, notes, and papers at the ready. Monticello’s Entrance Hall tells a story about the history of American culture and progress across many years. Its walls feature a variety of Native American artifacts, world maps, stone busts, and wild game mounts. As a reception area for Jefferson’s guests, the Hall was Jefferson’s opportunity to educate visitors about the culture of the surrounding region and their new country, as well as start a discussion about the articles in the room. 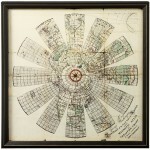 Jefferson was an avid collector of maps. In an ongoing effort to place Monticello within the larger universe, Jefferson established a museum in his double-story Entrance Hall, complete with maps of the world, European paintings and sculptures, and examples of items from the New World. Our Magnetic Atlas Print adds a Jeffersonian touch to your own walls. The print is a reproduction of Maryland cartographer John Churchman’s 1790 map inscribed to George Washington. 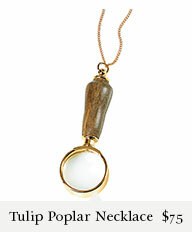 Its delicate attention to details suggests a former usefulness in charting the world as a magnetic entity. Gilles Robert de Vaugondy also known as Le Sieur or Monsieur Robert, and his son, Didier Robert de Vaugondy were leading cartographers in France during the 18th century. Didier was appointed geographer to Louis XV in 1760 and published globes of various sizes. The Monticello Globe with Stand is inspired by the 1745 Vaugondy globe, which showed the routes of contemporary explorers. The solid mahogany stand is a replica of an antique sphere stand. Bring his look home with our Campeachy Chair, which Jefferson appears to have popularized when he served as President and continued to use during his retirement at Monticello. Our campeachy chair is based upon a reproduction featured in Monticello’s parlor and adds a touch of elegant comfort to any office or living room. 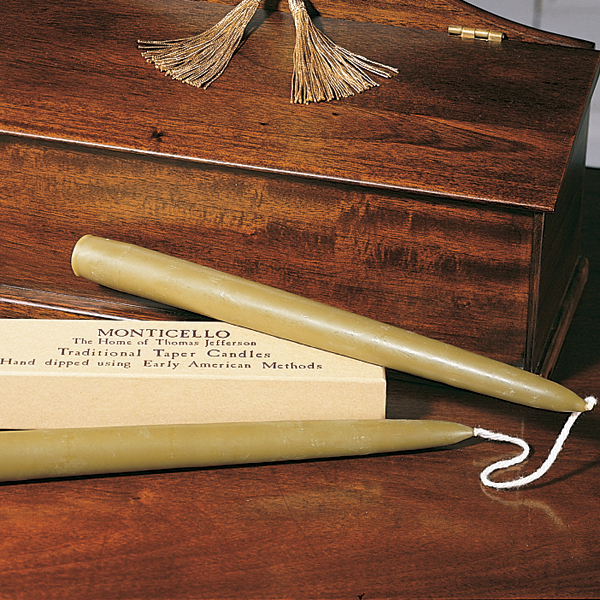 Mahogany accents are one of Monticello’s distinguishing style features. 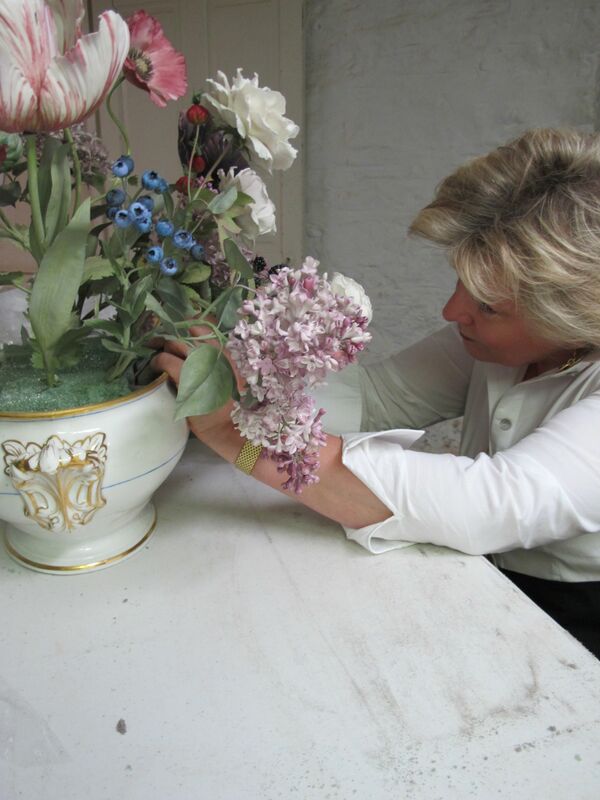 The Shop at Monticello reproduces the finest quality replicas based upon the originals featured inside the house. Martha Jefferson used the Joinery Work Table as her sewing station, storing various needles and threads in its two generous drawers. The table’s elegant design and convenient drop leaves make it a versatile statement piece. The Monticello Canterbury was used as a portable rack for storing music sheets inside the house. 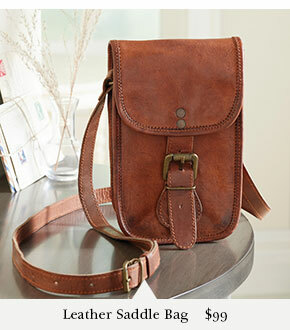 Still handy today, the Canterbury is perfect for storing magazines, newspapers, or frequently used files. The gorgeous mahogany woodwork and brass casters make this reproduction piece an elegant accent as well as a functional tool. Famous for his hospitality, Jefferson played host to members of his large family and numerous guests at Monticello. The Dining Room was frequently crowded with family and guests, invited and uninvited. Extensive recent research by paint experts indicated that Jefferson chose a brilliant chrome yellow for the Dining Room around 1815. It was one of the most fashionable colors of the time and also one of the most expensive: Chrome yellow pigment cost $5 per pound, twice as much as Prussian blue and 33 times more than white lead. Ralph Lauren Home, sponsor of the Monticello’s Dining Room restoration (June 2010), debuted a new paint color, Monticello™ Yellow in September 2010. 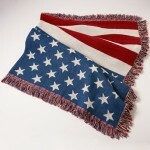 Ralph Lauren Home has been a longtime supporter of great American treasures, including funding for the preservation of the original Star-Spangled Banner at the Smithsonian’s National Museum of American History. Jefferson preferred a more casual style of dining but maintained his preference for classic style with his serveware. 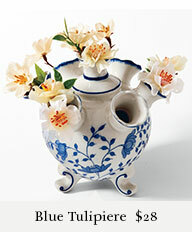 The Shop at Monticello reproduces several items seen in the Monticello Dining Room and Tea Room. The Creamware Basket was a staple in the dining room and the reproduction is perfect as a breadbasket or accent piece. It features an etched line design characteristic of the nineteenth century dining room. Our Jefferson Flatware Set is a modern adaptation of the original French “fiddle and thread” pattern used in the Monticello Dining Room. Impress dinner guests with the same elegant, classic look Jefferson preferred at his table. The Dining Room at Monticello also featured beautiful English pearlware with deep blue accents; our Monticello Reproduction Mug is based on pearlware artifacts excavated at Monticello. 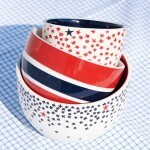 The handsome, hand-painted mug serves tea or coffee in classic, effortless style.